Price is per pass. Assembly required. This product is not available for store pickup. *Estimate only. Requesting changes, holidays, and customs clearance for international shipments may cause delays. 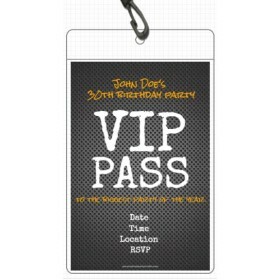 Lego Star Wars VIP Pass Party Invitatiion with Lanyard Make your friends and family feel like superstars with our Lego Star Wars VIP Pass Party Invitation with Lanyard ! It's great for any Lego Star Wars fan. 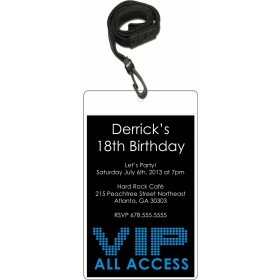 You can personalize the pass with your party info. It's fast and easy! 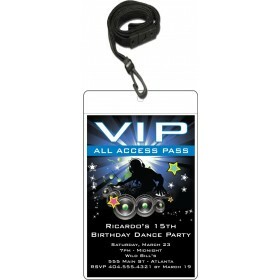 Includes a 4x6 invitation, clear vinyl pouch and black lanyard. 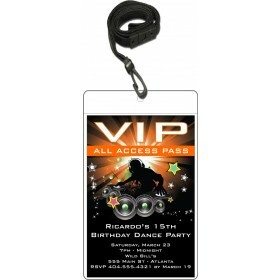 The lanyard is adjustable and break-away (quick-release) for safety. May the force be with you! Ship to Your Home (You will choose from standard or express shipping at checkout) This product is not available for pickup at a store.